A report on a twentieth-century neighborhood group. The meeting minutes book is a standard legal-sized ledger running 297 pages. The entries are hand-written in ink and cover the club's activities from January 25, 1927 to April 8, 1930. Within are the club's weekly considerations and actions ranging on topics from the removal of local cemeteries to the control of shifting sand dunes to protestations of neighborhood racial integration. Insight into concerns and values of San Franciscans of the time are to be found on almost every page, and officials from all levels of city government appear frequently. The Western Neighborhoods Project (WNP) is a California nonprofit corporation formed in 1999 with a mission to preserve and share the history of the neighborhoods on San Francisco's west side, including the Richmond District. In 2005, Paul Trimble lent WNP various documents, stationary, articles, and a meeting minutes book from the PPIA for photocopying and inclusion of copies in the WNP archives. In 2013, the Western Neighborhoods Project applied for, and was awarded, a grant from the San Francisco History Association (SFHA) to conduct an analysis and produce a report on the PPIA and the meeting minutes book. In 2014, Lorri Ungaretti of the Western Neighborhoods Project did a thorough analysis of the hundreds of handwritten minutes to create a finding aid of the major topics addressed in the meeting minutes book. This finding aid, included in this report, highlights trends, stories of interest, and neighborhood and city issues discussed. Woody LaBounty then conducted additional research and created this report on the formation and overall activities of the club from its origins as the Park-Richmond Improvement Club in 1908, to its decline and end in the 1970s. This report with finding aid has been archived on the Western Neighborhoods Project website (outsidelands.org), and printed copies have also been deposited to the San Francisco History Center at the San Francisco Main Library and the Richmond Branch library. The San Francisco History Association has full permission to use or republish any part of this document. A typical individual living in San Francisco at the dawn of the twentieth century could belong to a union as a printer, to a fraternal organization as a Woodmen of the World, to a church congregation as a Methodist, to an evening study group as an a hobby astronomer, to a local party council as a Republican, to a drum and bugle corps as a Knight Templar—all at the same time. The list of societies, councils, unions, clubs, and associations in the San Francisco directory of 1908 runs almost thirty pages. A neighborhood improvement or "booster" club bridged the concerns and interests of many of these other options, acting as a host organization of social and educational events, a promoter of local commerce, schools, and institutions, and a watchdog of municipal government. Ensuring the neighborhood received its fair share of city services—infrastructure, libraries, fire and police protection—was an essential mission of improvement clubs. These types of organizations boomed in San Francisco after the 1906 Earthquake and Fire. The disaster displaced tens of thousands of people, and spurred an increase in population and building activity in the outlying areas of San Francisco—including the Richmond District. Builders, real estate dealers, and investment brokers enticed renters burned out of older neighborhoods to buy buildable lots and speculation-built cottages in the sand dunes and scrubby fields of the Richmond, Sunset, Lake Merced, and Sunnyside areas. These new communities often lacked graded streets, streetlights, sidewalks, and had little more than basic utilities. Transportation options, schools, and fire protection were usually inadequate. Pioneering residents quickly formed improvement associations to lobby municipal government and utility companies for new and improved services. The strength and popularity of city neighborhood improvement clubs in these decades was such that the Richmond District could sustain up to half a dozen active groups in itself. The Park-Richmond Improvement Club, the Point Lobos Improvement Club, the Richmond Central Improvement Club, the Sutro Heights Improvement Club, the Arguello Avenue Improvement Club, and various merchant groups all held monthly meetings in the 1910s. Confederation summits of all the Richmond organizations were occasionally arranged as well. 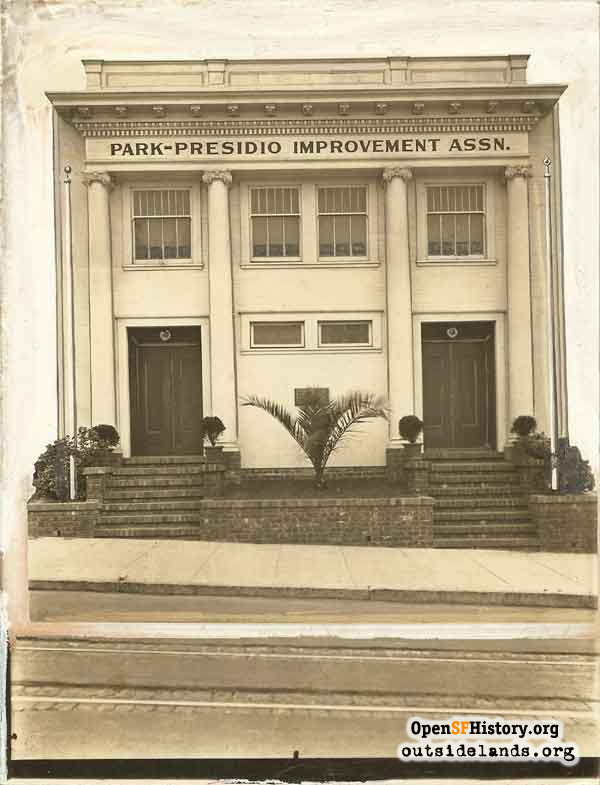 The Park-Presidio Improvement Association hall was built in 1913 at 649 Eighth Avenue. - Courtesy of Paul C. Trimble. Early meetings were held at 619 6th Avenue, the home of club vice-president George W. Morse, who was a foreman for the United Ice Delivery Company. In its first year the club called for slower speed limits of streetcars in the district, better fire protection, and a new branch library—and had success with each. The club also advocated for the allowance of concrete sidewalks, the banning of steam engine lines in the Richmond, and selecting Golden Gate Park as the site of the 1915 Panama-Pacific International Exposition (less successful with this issue, as the Marina District became the home of the fair). Another of the early efforts of the club became a signature activity for years to come: organizing ceremonies and presenting an American flag to dedicate the opening of a local school building. To raise funds for the flag and the dedication exercises of Frank McCoppin School on 6th Avenue, the club held a dance at the Richmond Masonic Hall (Arguello and Clement Street, a building still extent) on August 28, 1909. Into the 1930s, the club would perform a similar role in dedicating Argonne, Lafayette, Roosevelt, and other Richmond District schools. The removal of the large cemeteries around Lone Mountain became an immediate and decades-long cause for the association, one they inherited from predecessor Richmond organizations. Dating back to the 1850s, four large burial grounds impeded the extension of the Western Addition street grid into the Richmond. Many locals saw this blockage and the cemeteries themselves as a drag on economic development, especially as the cemeteries fell into neglect after the city banned further burials within city limits in 1900. Calls for removal were persistent by the club and The Richmond Banner until Laurel Hill Cemetery, the last hold out, was removed in 1939-1940. The club legally incorporated on March 12, 1912, which set it apart from more casual organizations of the time. This move may have been to enable purchase of a lot on 8th Avenue between Balboa and Cabrillo Streets, and the construction of a meeting hall on the site the following year. The building, emblazoned with "Park-Richmond Improvement Club" at its cornice, was a neoclassical structure designed by club officer J. J. Stahl. With its white façade of four tall columns framing the entryways, 649 8th Avenue looked less like a clubhouse and more like a bank, signaling the club's sense of institutional importance and permanence. The dedication ceremonies on November 2, 1913 drew Mayor James Rolph and wife, along with several city supervisors.9 The hall could hold over two hundred people for a meeting, and in addition to club activities, was rented out to other groups for dances, parties, lectures, and card tournaments. The focus of the club had grown with the organization. No longer simply interested in the 42 blocks that the Park-Richmond Improvement Club had charged itself to oversee, or even the whole of the Richmond District—which the association now crowed it was the preeminent spokesperson for—PPIA weighed in on issues of citywide, regional, and state importance. From the setting of city garbage rates to the making of the Hetch-Hetchy water system, from the creation of the Balboa Street trolley car line to the building of the Golden Gate Bridge, the Park-Presidio Improvement Association had meetings both mild and heated, drawing city and business leaders to speak. The Richmond Banner, with association officer Sinclair Trimble as publisher, wrote detailed articles on the PPIA meetings, debates, and endorsements, daring anyone to doubt the weightiness and importance of the association's judgment.13 The mayors, supervisors, and city agency members who paid their respects to the PPIA may or may not have been influenced by its opinions, but they felt its power enough to appear. Mentions of the PPIA in major city newspapers declined in the 1950s, and by the 1960s when it did appear it was often in the obituaries of longtime members. The group still weighed in on ballot measures, but the graying of the membership was reflected in the stances the PPIA took. In the 1920s and 1930s, the association had supported growth, infrastructure improvements, and large bond issues funding big civic projects. 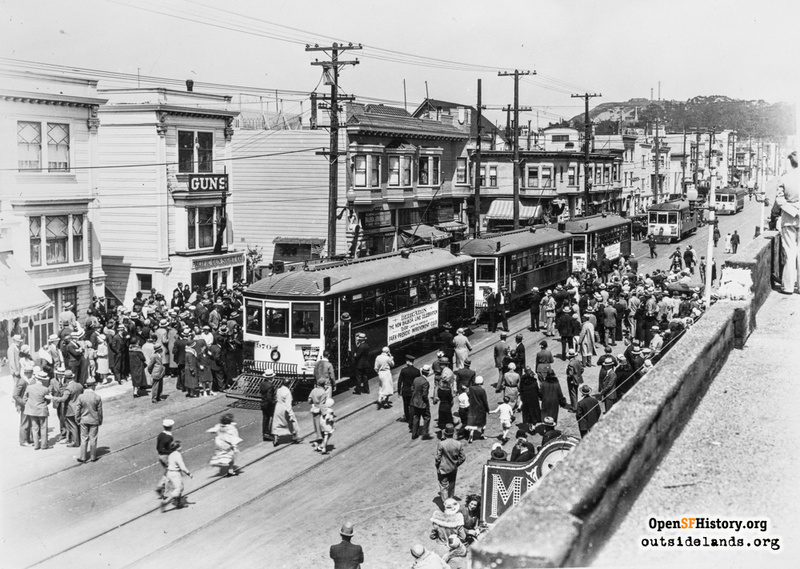 Post World War II, the club protested the removal of the Geary streetcar line for modern motor coaches (1955) and the widening of the boulevard to ease traffic and increase parking (1957), projects that city leaders and the Geary Boulevard Merchants Association supported. More conservative and less open to change, the PPIA completed the arc of many longtime neighborhood groups. Formed to create and strengthen community with events and new projects, and to secure a share of city services, the association grew into a shield against change in the neighborhood. Activity became limited to protest letters and "against" resolutions, and the events publicized were often backward-looking or history-themed. 1. 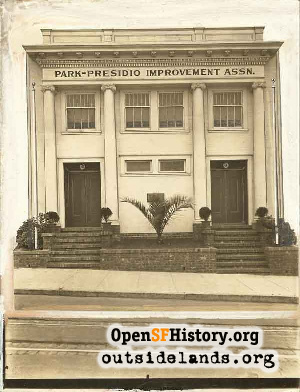 The association was often called the Park-Presidio Improvement "Club" in newspaper reports. 2. See Robert D. Putnam, "Bowling Alone: The Collapse and Revival of American Community" (New York: Simon & Schuster, 2000) for details on the rise and decline of this form of "social capital." 3. San Francisco Call, March 3, 1912, page 55, and "Civic & Improvement Organization List," Research Department of San Francisco Chamber of Commerce, compiled August 22, 1950. Document in Western Neighborhoods Project archives. 4. In fact, one origin story for the name of the neighborhood cites a club meeting for the idea, approval, and campaign to have the city certify "Richmond District." 5. San Francisco Call, June 10, 1911, page 19. 6. "Richmond District Made Model Residence," San Francisco Call, October 1, 1910, page 10. 8. "Richmond District Made Model Residence," San Francisco Call, October 1, 1910, page 10. Addresses and occupations of early members come from "Crocker-Langley San Francisco Directory for the Year Ending 1908" (San Francisco: H. S. Crocker Co., 1908). 9. "Friends Crowd New Clubhouse," San Francisco Chronicle, November 3, 1913, page 8. 10. "Park-Presidio Will Designate City District," San Francisco Chronicle, November 20, 1917, page 11. The supervisors did seem somewhat reluctant to make the change, asking for a "more general expression of opinion." 11. "Ordinance rescinding Ordinance 4397 and re-establishing the name of the area north of Golden Gate Park and west of Arguello Boulevard as the Richmond District." San Francisco Board of Supervisors File No. 090099, Ordinance 36-09. 12. A list in the meeting minutes book of new PPIA members in 1927 contains more than 80 names. Budget numbers come from PPIA treasurer's report for December 31, 1928. Copy in Western Neighborhoods Project archives. 13. The Richmond Banner may have been a once-a-week neighborhood newspaper, but actually had a paid subscription base and real influence in the district. 14. Copy in Western Neighborhoods Project archives. 15. The last listing for the PPIA at the address in San Francisco directories was in 1959. In 1960 and 1961, the address was listed as vacant and in 1962 the Slavic Adventist Church was listed at 649 8th Avenue. In 2016, the San Francisco Russian Seventh Day Adventist Church occupies the hall. Page launched 7 November 2016.